There was probably a small settlement at Goodrich prior to the arrival of the Roman Legions. Although there is little evidence of Roman occupation in the vicinity, the Romans did construct a road crossing the Wye near the ford at a Kerne Bridge. 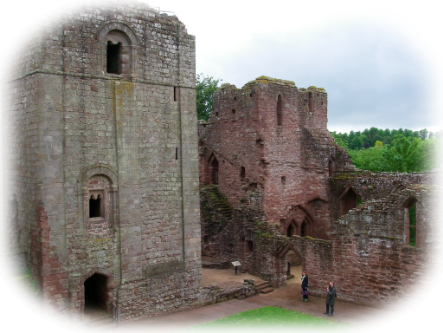 The early origins Goodrich Castle were first recorded in 1101 with references to Castellum Godric - ie Godric Mapsomme's Castle (who is mentioned by name in the Doomsday Book). Nothing remains of the structure of this former castle although its successor, Goodrich Castle, is in excellent condition for its age. Since the 12th century it has been extended and added to. 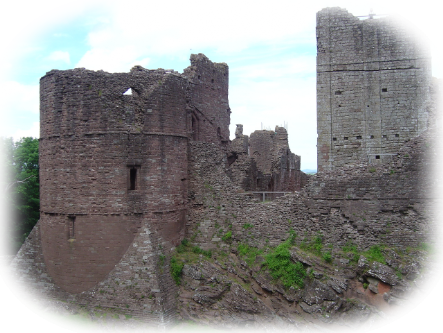 The red sandstone castle walls date from around 1300 and the moat was dug in the 14th century. The only original remaining feature is the tall, grey, stone Norman Keep built around 1150. 'Roaring Meg' is the 1m long cannon which played a key role in defeating the British Army during the English Civil War. It was the largest cannon in the world and boasted a capability of being able to fire a 200lb shot. Between the Cromwell’s Parliamentarians and Charles I’s Royalists. Roaring Meg fired a cannon which demolished part of the ‘Ladies Tower’ which forced the Royalists to surrender. Today the Castle has been extensively restored and, under the ownership of English Heritage, is open to visitors. 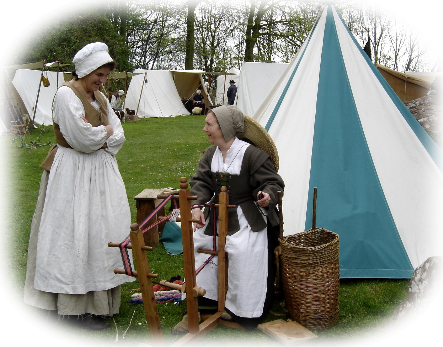 During peak Bank Holiday weekends, historical re-enactments and mediaeval entertainments are staged, giving visitors an insight into mediaeval life.